If you crash it, at least have a sense of humor about it ? I guess that what this owner was showing with their car. 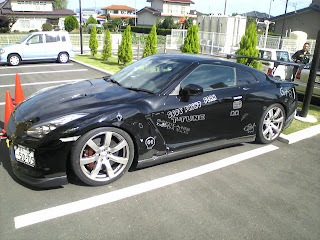 In a local hotel parking lot here in Fukushima a few weeks ago I stumbled across a nasty sight of a new GTR Skyline dented all down one side of her beautiful shiny black body.